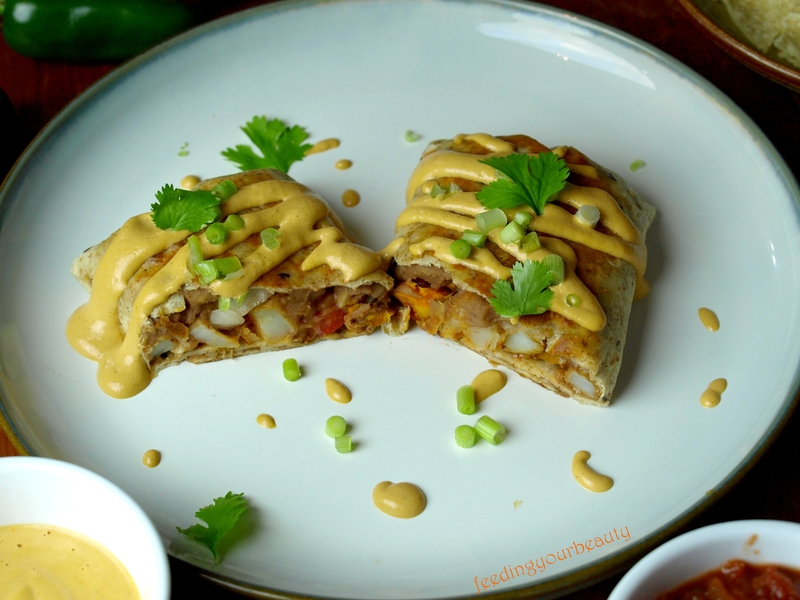 These skillet-grilled, hearty vegan burritos are stuffed with roasted and seasoned white and sweet potatoes, onions, tomatoes, and my special cheeze sauce. They are the perfect meal to prepare during the week, when you’re short on time, but positively hangry from running yourself in every direction all day. 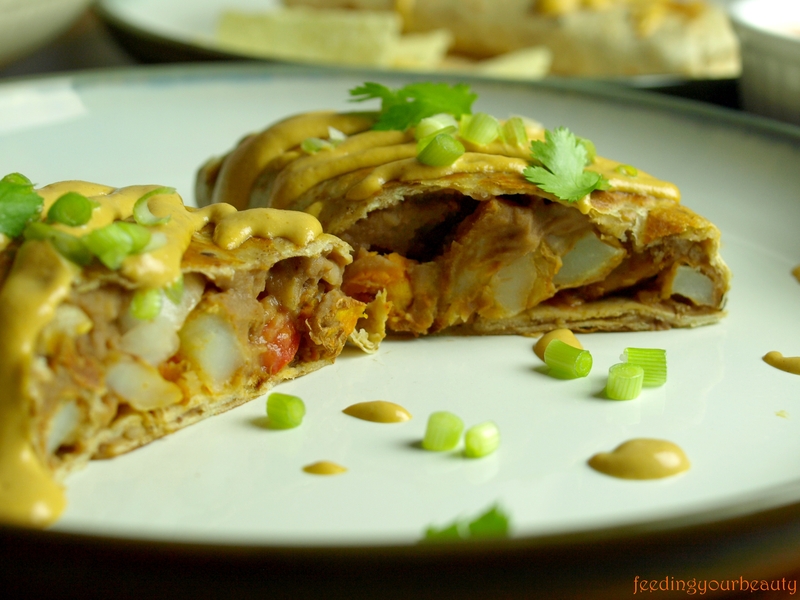 These filling burritos are ready in about 30 minutes and will make any Wednesday (or Tuesday, Thursday, Friday…) feel like a fiesta. So, before I get to the recipe, I just want to set something straight. I have not always been the healthiest or most conscientious eater. I’ve always been interested in nutrition, but my interests and my actions did not always coincide in perfect harmony. Six or seven years ago, guess who was the girl rushing into a fast food joint most days for her lunch break? That’s right, McDonalds, Dunkin’ Donuts, Wendy’s… they were all just a stone’s throw from where I worked, and I was no stranger to a drive-thru window. 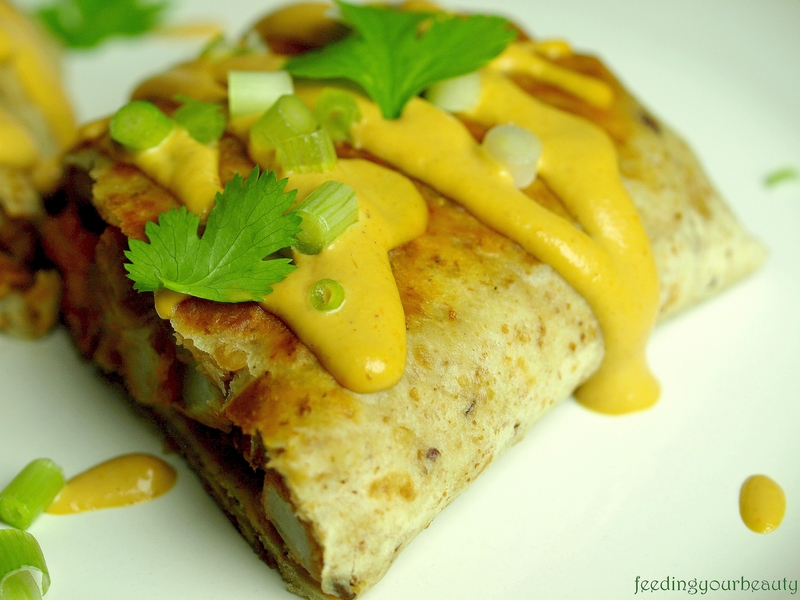 In fact, this recipe is inspired by one of my favorite options at another nearby faux-food restaurant, Taco Bell. Ah yes, I loved their grilled, stuffed burritos. They were fast, filling, and you could peel the wrapper back and hold it in your hand and eat lunch in your car while sitting in a sunny spot in the park. Sometimes when I chat with people about eating healthier, and how easy it can be to eat a plant-based diet, I can sense some suspicion. They seem to be under the impression that I’ve always been super healthy, earthy-crunchy, and it must just come easy to me. That I must have never really liked cheese and burgers, fried chicken, dairy ice cream, or cow’s milk in my morning cereal. Or that I have always given the fast food counter the cold shoulder. That I’ve probably always been this big health nut. That really couldn’t be further from the truth. When I ordered a burger, at McDonalds, you better believe I had to have cheese on it. In fact, sharp cheddar cheese and crackers was once my favorite snack. I drank cow’s milk like it was water. I’m not kidding, I drank milk with everything. Even pizza. I used to use chicken as my excuse to not go vegetarian… “but I could never give up chicken, I like it too much.” Fast food, restaurant dining, and ordering take-out was just so convenient. I figured since I was young and at a healthy weight, I could just eat whatever I wanted, wherever I wanted. When I heard disturbing truths about the animal industry, I would close my eyes and stick my fingers in my ears and say “la la la la… I don’t want to knowwww.” I liked what I liked, and was not about to restrict myself from “living life to its fullest” which to me equated to noshing on that greasy burger and fries if I felt like it. So, believe me when I say I understand. I never thought even seven years ago that I would be eating plant-based and making all my meals at home. I never would have guessed that I’d be blending up my own cheeze sauces out of nuts and seeds and nutritional yeast. I understand that hesitation, that sort of worry that creeps up your mind that, “isn’t this just getting a little too out there, a little too hippy-dippy? Am I going to have to change my name to Rainflower Earthchild?” Maybe it is a little out there, if you’re comparing it with the social norm. Now that I’m in my thirties, I have no problem being a bit different, or a little out there! Especially because I discovered that this way of eating makes me feel better, makes my skin brighter and clearer, and sets my conscience at ease (for several reasons, not least of all because I feel I’m doing my best right now, to keep myself healthy for many years to come). Now I crave healthier fare! Trust me, it happens. I feel in no way restricted (have you seen my Snickers recipe??). There are so many amazing, delicious, flavorful, vibrant, mouthwatering plant-based dishes out there that pretty soon that greasy, cheesy, sugary food just starts to kind of pale in comparison. If a former cheese-loving, chicken nugget dipping, milk guzzling, burger clutching, cream cheese pastry craver like me can have a change of heart and taste, then I believe anyone can. Anyway, what are we doing here? Oh yes, we’re makin’ burritos! Let’s get back to those. Really, these are so much better than fast food, and just as good as something you can get from a restaurant. The bonus? You get a much less expensive meal, made with whole food ingredients, that can be tailored to your tastes. Need it to be gluten-free? 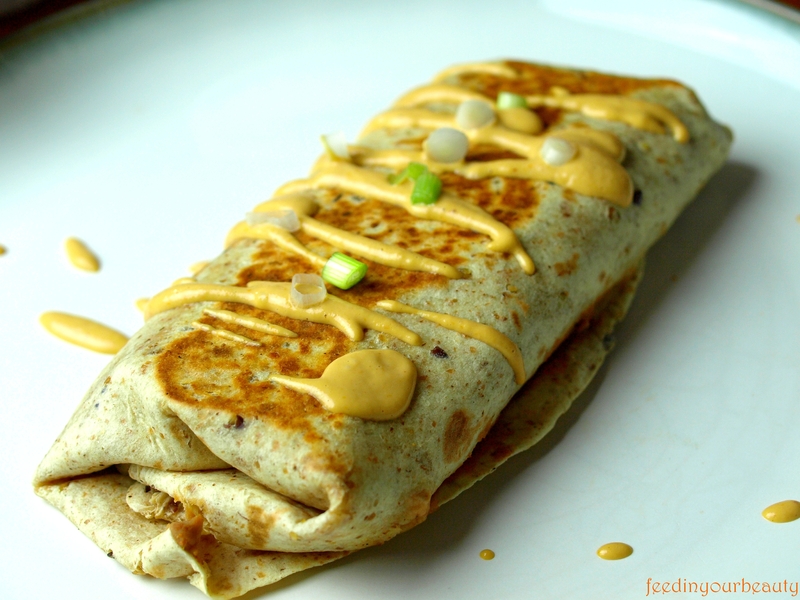 Use gluten-free wraps or tortillas. Want to spice it up? Add jalepenos or hot sauce. Want them to be saucier? Add a prepared enchilada sauce or make your own easy sauce. These are fast but not at all freaky because they’re made with real food that will nourish your body and fill you up. 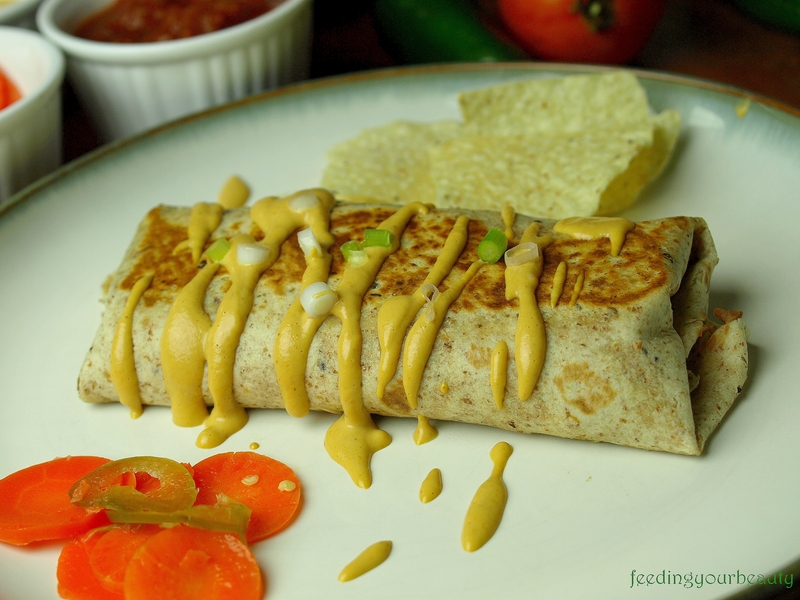 I invite you to think outside the bun, as well as way outside the fast food entrance, and make these easy burritos tonight! Pre-heat your oven to 400 degrees. Prepare a baking sheet with parchment paper or silpat. Combine potatoes with oil, spices, and season with salt and pepper and spread out on the pan. Remember, the smaller you chop your potatoes, the faster they’ll bake. Bake for 10 minutes, shake the pan or stir/flip the potatoes and bake another 8-10 minutes or until crispy, browned and very tender. 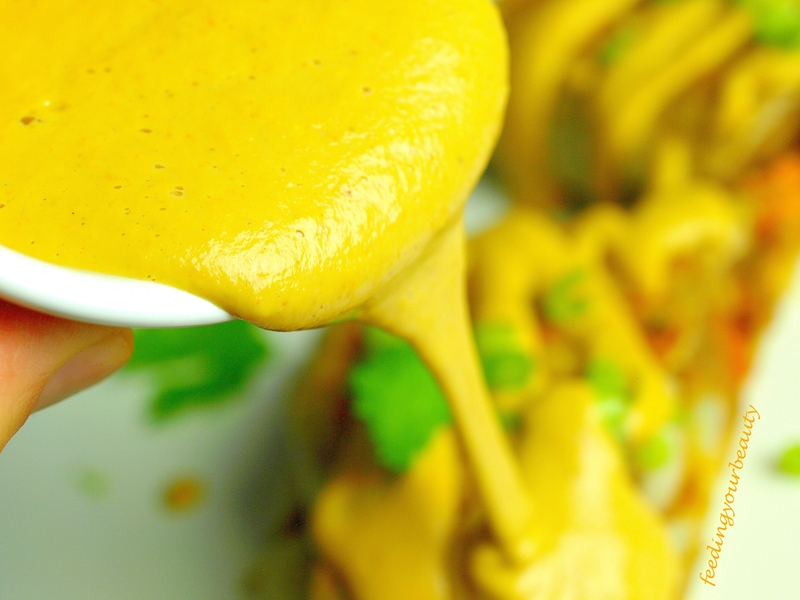 Make the cheeze sauce in your blender. Also, prepare your other ingredients. I like to warm the beans in a small pot. Assemble the burritos. Lay out the tortilla shells and spread with beans and top with potatoes, onions, cheeze sauce, and other toppings, then fold the sides over. Umm, you had me at potatoes and cheese… I’m all in for this! Thank you. I know I’m late to the party here, but these look delicious! How many burritos does this recipe make? Thanks Sadie! Depending on the size of the tortillas, it will serve 2-4. The recipe easily feeds my little family of 3 with one of those being a 4 year old 🙂 Enjoy!